Cars and alcohol don't mix, especially cars with RWD and copious amounts of power. Automotive engineers work their butts off to make the cars they design as safe and enjoyable as possible. Over the hundred plus years that humans have been building cars, we’ve gotten pretty good at ensuring that vehicles are easy to control and prioritize occupant safety, which means that until autonomous cars are out driving for us, human error is the main killer of cars on the road. Take this case of a smashed Alfa Romeo Giulia found by Autoblog Netherlands as an example. The reason this crash hits us right in the feels is that the Alfa Romeo in question is a Quadrifoglio model with 505 horsepower coming from 2.9 liters of twin-turbo real estate that’s forged in the Ferrari factory. Given that the car is so new, it’s one of the first crashes that’s taken place involving a clover-branded Alfa Romeo. To make matters worse, the 46 year old Italian man who crashed the car didn’t do so while trying to set a record lap time or learning the limits of the car. No, this guy’s only explanation is that he tossed back a few too many before setting out for a cruise in his four-door rear-wheel drive missile. It’s unclear how he lost control and managed to plant the Giulia’s impeccable nose into the concrete barrier, but then again things tend to get a bit hazy when under the influence. Luckily, neither the man or other passengers and pedestrians that may have been occupying the road at the time were hurt, but we’re sure that the driver had their hangover exacerbated by the fact that he managed to crash his car in Switzerland, a country that doesn’t take too kindly to drunk driving. Aside from the estimated 40,000 Euro in damages to the car, the man will need to pay a hefty fine to the Swiss authorities as well as 37,000 Euros for the concrete block (is it made of gold?) and could either get jail time or have his license suspended for a period of time. Thankfully no one was hurt and with any luck, the experience can serve as a lesson to the driver. So far as we know, this is the second crash of a Giulia QV to take place with the first being at the hands of an overly zealous test driver. 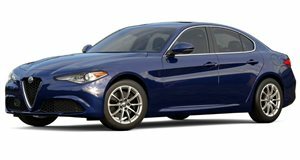 Important to note: so far the two Alfa Romeo Giulia QVs that have been wrecked are white. Maybe go with red? Photos found on Autoblog Netherlands.